Academies: How to overturn bad policy without becoming the voice of negativity. I’m a teacher, I’m a Christian and I’m fed up of simply moaning about the DfE. That’s the simple position I had come to as I wrote my speech in response to Nicky Morgan’s latest announcements. Last weekend the NASUWT gathered in Birmingham ready to be on our best behaviour. Mrs Morgan was intent on provocation. By and large, we were good boys and girls and were only critical of the Secretary of State when she told us that the shortage of teachers of England, a crisis she also refuses to admit, is all our fault. That’s right. It’s the trade unions’ fault for always being so negative about policy announcements. As I’ve said elsewhere, that’s like telling a hall full of doctors that the only reason hospital wards and surgeries are full of sick people is because NHS staff go round telling people they’re unwell! And so in asking us to be the voice of positivity, the position at which I had already arrived, Nicky Morgan was essentially I believe, unwittingly giving us the blueprint of the current white paper’s downfall. That is, primarily, that all schools in England must become Academies. I’m very blessed with such an amazing group of friends. Many of them passionate about education. Many of them teachers. They are by no means all the same. This is true in the ballot box as well as in wider life, and I like having my own arguments tested and challenged. I like being able to seek God’s heart for the children in this country. I want to see an education system that gives room for every expression of creativity that a creator God puts into his children. I too believe in aspiration, I too want to see kids with a lack of vision for their adult life be able to harness and maximise all the gifts and abilities that God has given them. In God’s house there are many rooms. Dare I even say, classrooms. Very many of those rooms may contain 6 and 7 year olds for whom learning grammar to a level of forensic accuracy (never before witnessed in national public schools) does nothing other than crush the love of learning. I hope I’m wrong. Very many of those rooms may contain children, who might like their teacher to be focused on delivering engaging and joyful lessons, not, so-buckling under the weight of workload, scrutiny and financial struggles that they have long lost their spark let alone able to ignite inspiration in others. And so how do we greet this legislature? We value the precious gift that is our nation’s children. We honour, support and trust the teachers of this land. We engage with those who seek to implement changes to our schools that will degrade a system that was once the envy of the whole world. We invest. We show them a better way. We show them fulfilled aspiration can look like a young man working on a car assembly line as much as it can look like the CEO of Goldman Sachs. We hate the policy, but not the politician. We love our neighbour as we love ourselves. @Victorious_Paul Paul teaches Maths in a secondary school in Warwickshire. He is Federation President of the Warwickshire NASUWT and lives in Coventry with his wife and daughter. 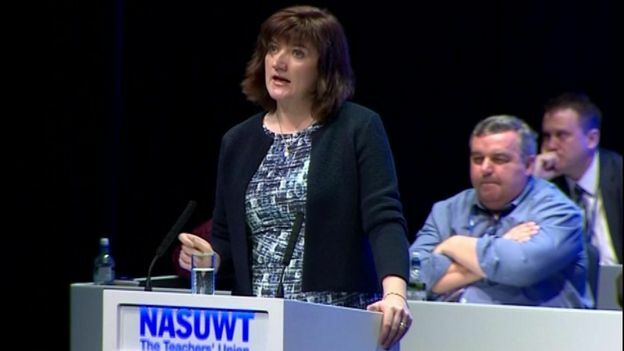 You should totally check out Paul's speech to the NASUWT conference: it can be watched here. Christians on the Left member and volunteer Matthew Judson sets out a case for extending the franchise to 16. The word democracy comes from two Greek words meaning for people (‘demos’) and power (‘kratos’). Thus a democracy is a state in which power belongs to the people. Throughout its history, the institution of democracy has gradually emerged as the political system which best empowers citizens, creates equality and provides accountable government. At the very least it is generally accepted in our society as ‘the worst form of Government except for all those other forms that have been tried from time to time’, in the words of Winston Churchill.